Flagler College President Dr. Joseph G. Joyner signs the agreement sitting next to CFAU Vice President LI Hongmei. 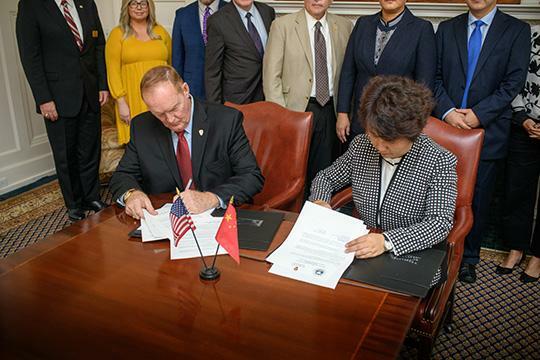 SAINT AUGUSTINE – Flagler College has entered into an agreement with China Foreign Affairs University (CFAU) for faculty and student exchange. The agreement was signed on Monday, Nov. 26 and is effective immediately with programs set to begin in the spring semester of 2019. CFAU is the preeminent university for producing diplomats and foreign affairs and policy specialists in China. Celebrating its 50th year, this is a milestone for Flagler College as it plans for diversity, inclusion and increased cultural awareness in its programming college-wide in the next five years. The exchange program will continue to build upon similar partnerships that have been established with universities in Germany and other countries. The new exchange program will begin in the spring when the first visiting faculty member arrives to teach an introductory course on Chinese culture and language – offering a “panorama tour of China from traditional culture to modern living” per the proposed course catalogue description. Flagler students who participate in a study abroad to CFAU or in the exchange program will have unique opportunities for engagement. Program highlights for Flagler students will include access to press conferences, summits, conferences and learning among one of the brightest student cohorts in China. CFAU has a distinct curriculum designed around a 7:1 student to faculty ratio which is essentially unheard of in Chinese higher education. CFAU is the only university officially aligned with the Foreign Affairs Ministry of China. Located in Beijing, students have unparalleled access to diplomatic and foreign ministers, top law professionals and international organizations. CFAU also boasts more than twenty research institutes and centers, allowing direct access to the country’s top research in several fields including international relations, international education and world economics and trade. The Chinese delegates who visited Flagler cited the school’s history, diversity and open-mindedness as reasons that it “Is the right choice” for the partnership, according to Vice President of CFAU LI Hongmei. Vice president LI noted that the cornerstone of education is learning from other cultures and seeing things from a different perspective. Thus, CFAU delegates will be making one more stop on their weeklong trip; a similar agreement will be made with another school on the west coast.